Transform stuffed jalapeños into a sandwich with our Jalapeño Grilled Cheese recipe. 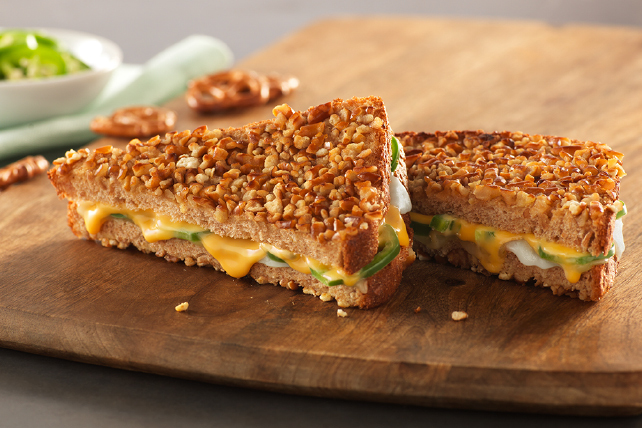 This Jalapeño Grilled Cheese includes pretzels for extra crunch. Fill bread slices with next 3 ingredients to make 2 sandwiches. Whisk egg and milk in pie plate until blended. Dip sandwiches, 1 at a time, in egg mixture, then in pretzel crumbs, turning to evenly coat both sides of each sandwich with both ingredients. Melt 2 tsp. butter in medium skillet on medium heat. Add sandwiches; cook 2 min. or until bottoms are golden brown. Add remaining butter to skillet; turn sandwiches. Cook 2 min. or until bottoms of sandwiches are golden brown and cheeses are melted. You will need to crush about 16 small pretzel twists, or about 3 large twists, to get the 1/3 cup crumbs needed to make this recipe. Substitute 8 round butter crackers for the pretzels.